nor what kind of clothes I wore. 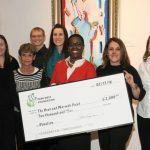 On April 25, 2009, For The Seventh Generation will hold its second annual fundraiser, In Seventh Heaven, at Park West Gallery in Southfield. In Seventh Heaven will feature an evening of food, art, spirits and music set throughout the elegant 63,000 square-foot gallery. The highlight will be three auctions: an online auction that will begin on or about April 1, a silent auction and a live auction featuring works of art donated by Albert and Amelia “Mitsie” Scaglione. For The Seventh Generation provides non-law related services to all neglect and abuse wards of the court, by encouraging and matching volunteer community organizations and individuals with a child and family in need. Any organization or individual who desires to offer direct and tangible help will be given the opportunity and structure to participate in a program that directly addresses the special needs of that child and his or her family. Our goal is to bring the children and our community’s resources together in an efficient, timely and continuing manner by serving as a “clearing house” to match those willing to volunteer their time, talents or merchandise to those children identified as needing such assistance.